It's one thing to listen to a detective show -- it's another thing to actually be a part of the drama yourself! That was the concept behind one of radio's early attempts at interactive programming, Calling All Detectives. Not quite a quiz show, not quite a straight mystery drama, the program invited listeners to send in their phone numbers -- and at a strategic moment in the unfolding of a fully-dramatized mystery sketch, the drama would pause, and a listener invited by telephone to figure out the solution. 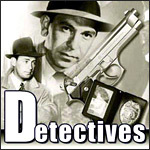 The format made for intriguing listening during its 1945 run over Mutual, and its dramatic segments (featuring actor Paul Barnes as Detective Jerry Browning), were good enough that they were edited down to fifteen-minute portions (minus the quiz elements) for syndicated distribution. Is the Wife Really Dead?